The smoke may have cleared, but now the rebuilding of lives begins…. We may have seemed a bit quiet here on the Eco Atlas front lately, but there has been the matter of some firestorms on the Garden Route. It was even on CNN. I think what so many found hard to assimilate is the concept of their holiday paradise burning. How can the Garden of Eden burn? Well actually the Garden of Eden forest didn’t burn because it’s thick indigenous forest which doesn’t naturally burn. But so very much did burn… people’s homes and animal habitats. Having said that about the forest though, we’ve actually been watching a circle of burnt forest grow and grow over the past 6 months as it slow burns underground through the drought dry roots spreading from tree to tree. So indigenous forest can slow burn in these drought conditions. But not like the alien invasive species and exotic plantations of pine, wattle and bluegum, they take burning to a whole other level, literally, quite a few stories higher as anyone who witnessed the flames here will tell you. It’s a wall of fire. 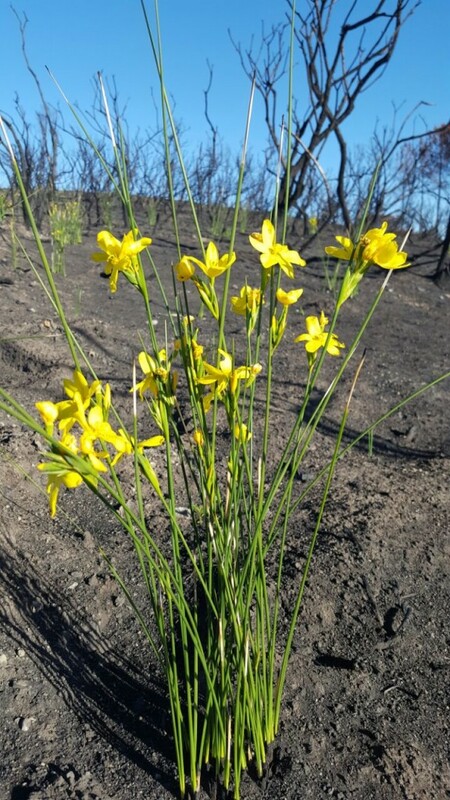 And as for the fynbos, well that’s meant to burn every 15 years or so to germinate the seeds and clear the woody old growth. 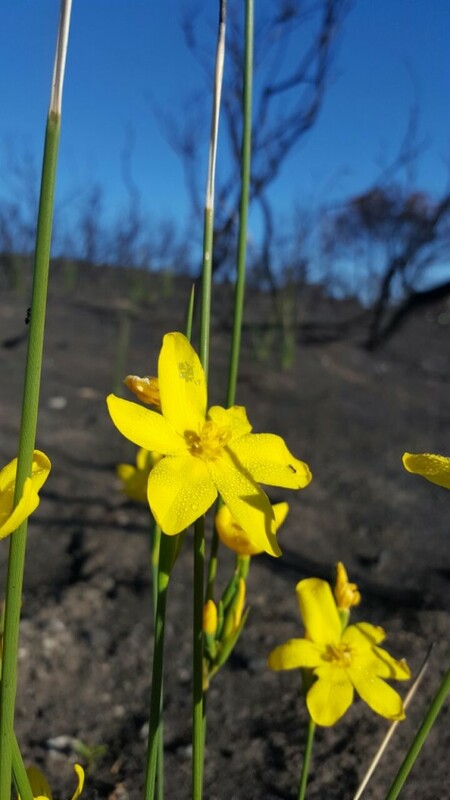 But it burns through fynbos like a flash fire, fast and not too hot so that the creatures who play a part in the life cycle of regeneration after fire can survive. So we really were the proverbial canaries in the coal mine when our home fell in the path of a firestorm that came out of nowhere on a hot and dry north westerly gusting day 4 months ago. Not quite out of nowhere though, because while there was no smoke when I left home to pick up the children from school, there had been a smouldering fire in the alien stands of trees for weeks which was very tricky for the firefighters to quell due to the density of the trees and the fact that it burns underground. It didn’t matter that we had no alien invasives on our property, once the fire is fuelled by wattle and gum and chooses a path with the wind there is no stopping it. And now we are joined by so many more climate change refugees here on the Garden Route, statistically it is uncanny how many of my circle of friends have lost their homes to fire, we can literally have a dinner gathering and every single person there will have lost their home. Normal is not part of the equation anymore. And while we plot and plan the rebuild of our home which is soon to begin (and we will document the process for those that need to follow to see how a truly eco, sustainable, efficient and climate resilient home can rise from the blank slate of ashes, watch this space) there are so many who still have a lot to process and a long journey ahead before they have the sanctuary of their own home again. Donate to an individual family who needs to rebuild their home, there is a very long list of families to help listed here. You can also have a look at Ana and Gareth, the Reitz family, Erez and Louisa, Peter and Gabriella, James Wolfaardt, Paul and Magic, Gilan and Jos, The Heartland School of Self Sufficiency to mention just a few that I know of or have helped set up. There are many many more families needing support, especially those without insurance, so have a look on the BackaBuddy site. 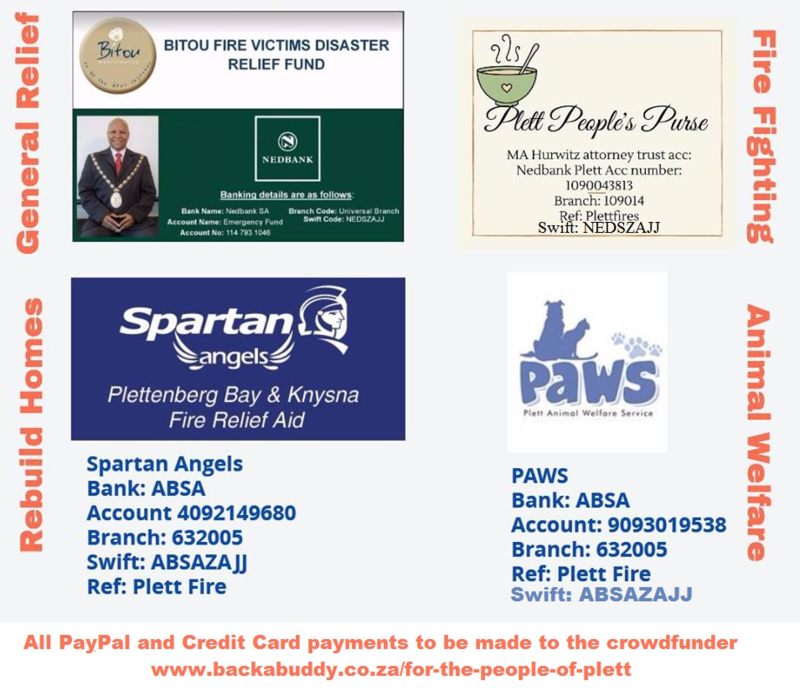 Donate to a group fund for Plett that will focus on the rehabilitation of injured firemen and ensuring the firefighters are properly equipped to fight more fires and any overflow will go to those who have lost their homes. 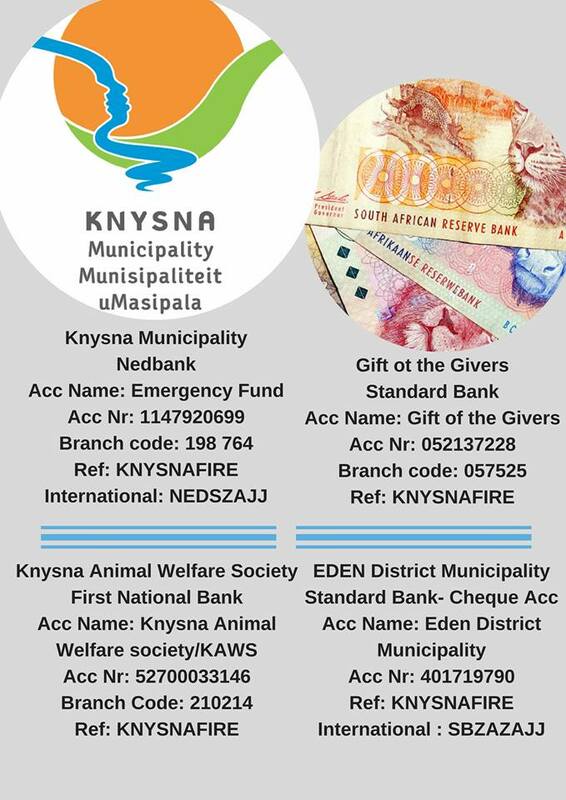 Donate to a group fund for Knysna that will focus on the rebuilding of homes. Read up on the effects of runaway pines and other invasive aliens on water catchment and fires in the future. Then make your voice heard to your local and national leaders to ensure that this problem is nipped in the bud. Literally. Remove alien invasives from your own properties especially those with a high fire risk such as pine, eucalyptus and wattle and replant with trees and shrubs indigenous to your area. Motivate your neighbours and any government or SANRAL owned land to do the same. Get involved with the active reforestation of the area with The Precious Tree Project, email them on 1000precioustrees@gmail.com if you would like to donate trees. The Green Ticket is another organisation that focusses on reforestation of the Garden Route. Donate to other animal welfare groups besides KAWS and PAWS who are also focussing on fire relief for domestic and wild animals. Moya Animal Outreach, Knysna Vet, Bitou Horse Welfare. Or help with your skills, if you have knowledge of insurance then assist those who have it through the quagmire to make sure they are treated fairly, if you have skills in sustainable building or reforestation make yourself known and help rebuild the Garden Route. 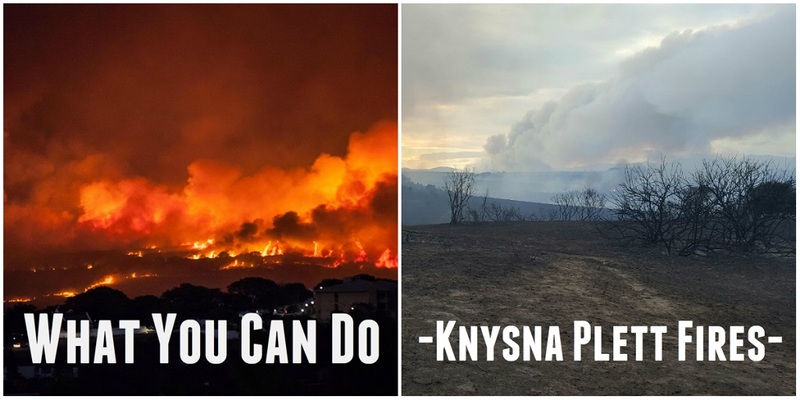 Contact Knysna Fire page or Plett Fire page to offer up your services. Losing your home and your sanctuary and seeing the green of the garden blackened is like having the world pulled out from underneath you. And while fires are a natural part of ecosystems we need to recognise that human activities have impacted on their ferocity due to our affect on the climate and the naturally resilient systems. This is our chance to do things differently and to emerge Stronger, Greener and Better for a future in which we need to be resilient to constant change. How will you be taking action? Loved your comments about aliens!!! However the gum trees are an important food source for bees as well as nesting places for raptors. We cleared our farm of all aliens leaving a few pine trees which often have a raptor perched on top….so maybe it would be a good idea to start with the wattles and the port jackson , which, I’m afraid are going to come up like hairs on a dog’s back after the fire! !